A few weeks ago, our parents went to a party and requested that we make something for them to bring. We made these cupcakes (a whole bunch of mini ones, plus a few regular ones for pictures!) and wow, were they amazing! The pumpkin cake is truly delicious, with the perfect amount of spice and the right texture. Cream cheese pairs naturally with spiced cakes (such as carrot cake or gingerbread), so it goes nicely here. 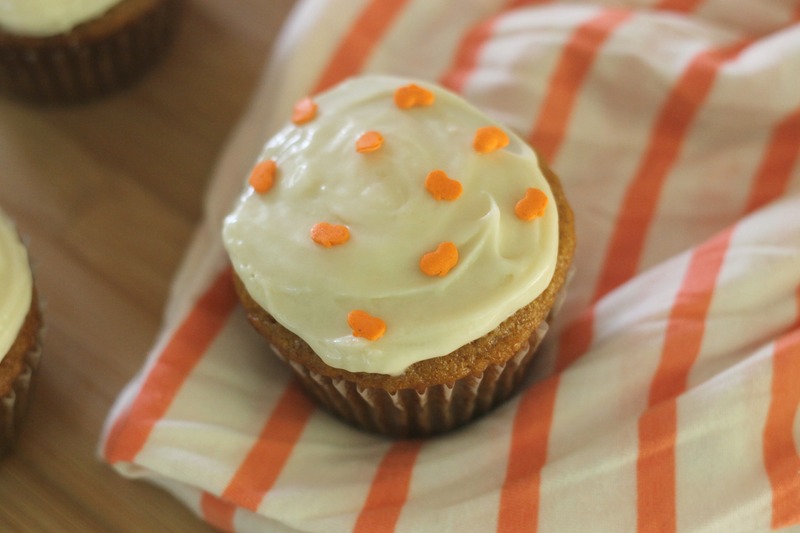 These cupcakes are like pumpkin roll but more convenient! They are our favorite treat we’ve made this fall and we are looking forward to making them again. Preheat an oven to 350°F. Line three 12-cup muffin tins with cupcake liners. In a bowl, sift together the flour, baking soda, baking powder, cinnamon, nutmeg, cloves and salt. Toss the walnuts and raisins with the flour mixture, if you are using them. In a large bowl, whisk together the pumpkin, granulated sugar, brown sugar and oil. Add the eggs one at a time, whisking after each addition. Add the flour mixture in three additions, stirring until just combined (we recommend using a rubber spatula). Fill the muffin tins about three-fourths full. Bake until the cupcakes are golden and a toothpick inserted into the center comes out clean, 20 to 25 minutes. Transfer the tins to a wire rack and let cool for 10 minutes, then remove the cupcakes from the tins and let cool completely. Beat together the cream cheese, butter, and vanilla until smooth. Sift in the powdered sugar in batches, mixing until combined. Spread over the cupcakes. Serve and enjoy! 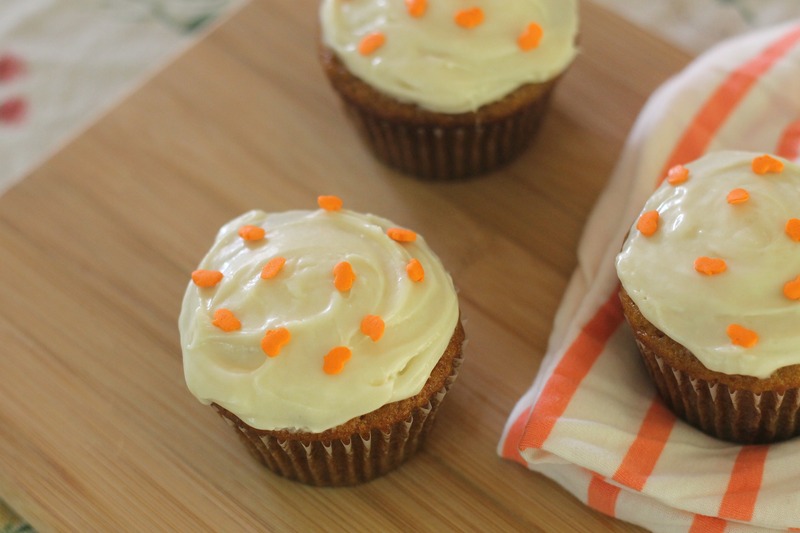 Note: since the frosting is perishable, make sure to refrigerate the cupcakes if you do not eat them within a couple hours (which you probably won’t, since this recipe makes a lot of cupcakes! ).